Emoto Music » OO in Santa Monica Tomorrow Night! OO in Santa Monica Tomorrow Night! 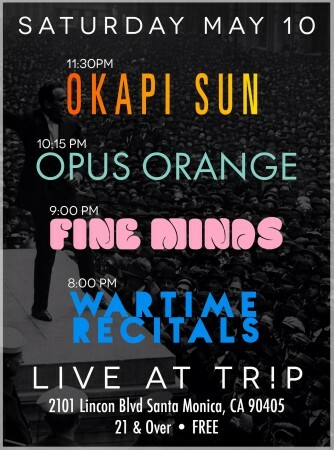 Opus Orange will be playing FREE show tomorrow night at TR!P in their home town of Santa Monica! Please don’t miss the opportunity to see them rock out with special guests: Wartime Recitals, Fine Minds, and Okapi Sun. Come early, have some drinks, stay late, enjoy a great evening full of great music! Click here for all the info.